a great recap on the healthy and natural products from the beehive! Tulsa's Natural Food Market, Akins, provides great articles covering products and health issues. This article defines all the products that have become available to us from bees: Bee Pollen, Bee Propolis, Royal Jelly, and Honey. Bee Pollen is the male seed of a flower or plant which is collected by bees and transported back to the hive to nourish the colony and structure of honeycombs. Bee pollen has proven to be an interesting substance to scientists because it is a very nutritious food, containing more enzymes and co-enzymes than any other food, along with 22 amino acids, 27 minerals and numerous vitamins. Bee pollen has been used for several purposes, including reducing allergies. Bee pollen contains quercetin, a bio-flavoniod that inhibits the release of histamine, the chemical responsible for allergy symptoms. Bee pollen has also been used to improve the immune system and increase energy and endurance. Bees create propolis by collecting sap from trees and mixing it with wax in their hives. Propolis is a complex product that contains a variety of phytochemicals, many of which have been shown to possess antibacterial and antiviral properties. These properties work in the body to increase resistance to disease by internally stimulating the immune system. Propolis also contains several bio-flavonoids, which help strengthen the capillary blood vessel system. Propolis is used to fight off infection both internally and externally. Royal jelly is a secretion made by worker bees that is fed to the queen bee. This substance transforms a female bee into a queen bee and increases her life span and her fertility. Royal jelly has a gelatinous consistency and contains numerous nutrients. It is a rich source of protein and essential amino acids, B vitamins, minerals and trace minerals. Along with the other bee products, royal jelly possesses antibacterial activity. (Note: Asthmatics should use caution when taking royal jelly internally.) In addition to internal use, royal jelly is also useful externally. In creams, masks and lotions, royal jelly acts on a cellular level to increase circulation and deliver more oxygen to the skin. Over time, wrinkles are reduced and the skin becomes soft and more youthful in appearance. Bees make honey with the use of nectar from flowers. There are many varieties of honeys depending on the flower from which the nectar is gathered. Honey is most commonly used as an alternative sweetener to refined white sugar. While some argue that honey is no different than sugar, others believe differently. In his book Honey, Garlic & Vinegar, Dr. Patrick Quillin states "...honey is a complex collection of enzymes, plant pigments, organic acids, esters, antibiotic agents, trace minerals like chromium and other unidentified nutrition factors." As with the other bee products, research done on honey has revealed the antibiotic properties of honey, mainly when used externally on wounds and burns. Honey is also used as an ingredient in cosmetic formulations for its hydrating and toning effect. Bees provide us with numerous products that aid in improving our immune system. 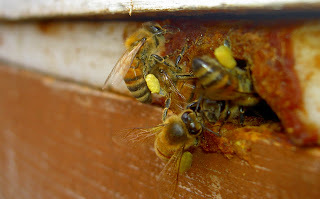 Next time you need an antibiotic, consider bee propolis; or to reduce allergies, think of bee pollen on a daily basis. Remember raw and fresh is best even when you are talking about bees. Flavonoids possess strong anti-oxidant and cancer chemopreventive activities. Chrysin (5,7-dihydroxyflavone) occurs naturally in many plants, honey, and propolis. In vitro, chrysin acts as a general anti-oxidant, causes cell cycle arrest and promotes cell death. However, the mechanism by which chrysin inhibits cancer cell growth and the subcellular pathways activated remains poorly understood. Effect of dietary supplementation with chrysin on proliferation and apoptosis during diethylnitrosamine (DEN)-induced early hepatocarcinogenesis was investigated in male Wistar rats. To induce hepatocarcinogenesis, rats were given DEN injections (i.p, 200 mg/kg) three times at 15 day interval. An oral dose of chrysin (250 mg/kg bodyweight) was given three times weekly for 3 weeks, commencing 1 week after the last dose of DEN. Changes in the mRNA expression of COX-2, NFkB p65, p53, Bcl-xL and β-arrestin-2 were assessed by quantitative real-time PCR. Changes in the protein levels were measured by western blotting. Chrysin administration significantly (P < 0.001) reduced the number and size of nodules formed. Also, a significant (P < 0.01) reduction in serum activities of AST, ALT, ALP, LDH and γGT were noticed. Expression of COX-2 and NFkB p65 were significantly reduced whereas that of p53, Bax and caspase3 increased at the mRNA and protein levels. Likewise, a decrease in levels of β-arrestin and the anti-apoptotic marker Bcl-xL was also noted. These findings suggest that chrysin exerts global hepato-protective effect and its chemopreventive activity is associated with p53-mediated apoptosis during early hepatocarcinogenesis.